Here at Aqua-Marina we are very passionate about all things diving! This passion extends well beyond the usual depths which divers go to – we always want to learn more, see more and do more, underwater! We first made moves towards providing Technical diving back in 2010, when the core team of staff all became PADI Tec Deep Instructors. This qualified us to teach technical diving down to a maximum depth of 50 metres. At this depth it is still safe to breath air, and rich Nitrox mixes or pure Oxygen are used to accelerate the decompression. To venture beyond 50 metres requires a different gas mix, since air at these depths would be extremely narcotic and the natural oxygen content would become potentially toxic. Helium is an inert gas (meaning it has no effect on the body) and has an extremely low molecular weight (meaning that it has significantly lower narcotic properties than Oxygen and Nitorgen). Trimix is a (customisable) mix of Oxygen, Nitrogen and Helium which allows it’s users to venture into extreme depths. At the time of writing, the deepest successful dive completed using open-circuit scuba equipment was to a staggering depth of 332.35 metres! Now, we’re not advocating that everybody try to match or beat this record – this takes years of preparation, not to mention the acceptance of extreme risk; but this is the potential of adding a little bit of Helium to our breathing mix. 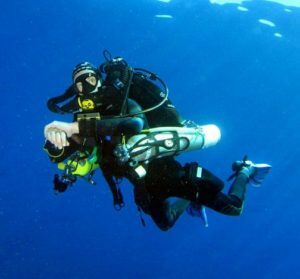 Since first becoming qualified to teach Tec diving, many of us have advanced our training to include Trimix and Rebreather qualifications – we all love the deep and take every opportunity to explore further! 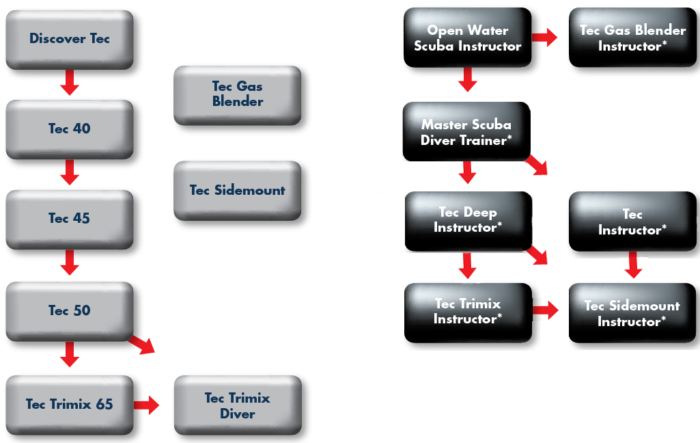 As of April 2019, our resident Platinum PADI Course Director – Mike – has qualified as a PADI Tec Trimix Instructor, meaning that we now offer training up to Tec Trimix Diver. This can be done with back-mounted cylinders or in Sidemount configuration. Tec Trimix training is broken into two levels: Tec Trimix 65 qualifies the user to dive to a maximum depth of 65 metres using ‘normoxic’ Trimix (the same Oxygen content as air – 21%). 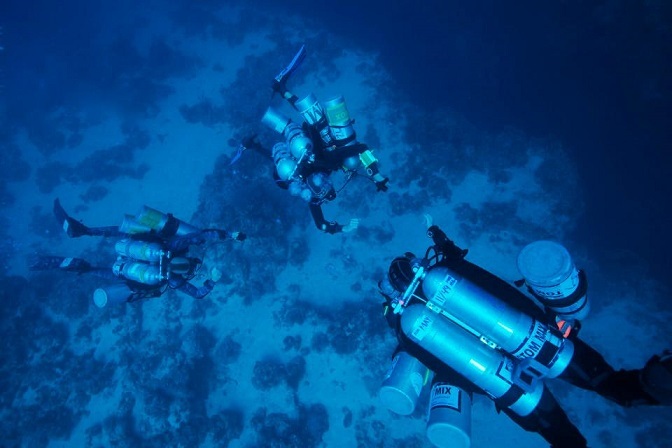 Once a diver becomes accustomed to making dives within this range, they can advance to Tec Trimix Diver, which qualifies them to breath ‘hypoxic’ Trimix (A trimix with a lower oxygen content than found in air, allowing the gas to be breathed at deeper depths without fear of Oxygen toxicity). Here in Tenerife we have ideal conditions to offer this training. The water is clear, without common fast-moving or unpredictable currents, and a year-round comfortable temperature for long dives. More importantly, we are sitting half-way up a huge volcano which has its base some 3,500 metres below the waves! We only have to travel a short distance from the coast to find whatever depth we could possibly aim to dive to. With our eyes on the future as much as the depths, we are working towards becoming Tenerife’s first PADI Tecnical Diving Instructor Training centre, as venturing into Closed-Circuit-Rebreather (CCR) diving. No matter where your interests lie, Aqua-Marina are exclusively positioned to provide first-rate, thorough and comprehensive training to get you down to where you want to go!